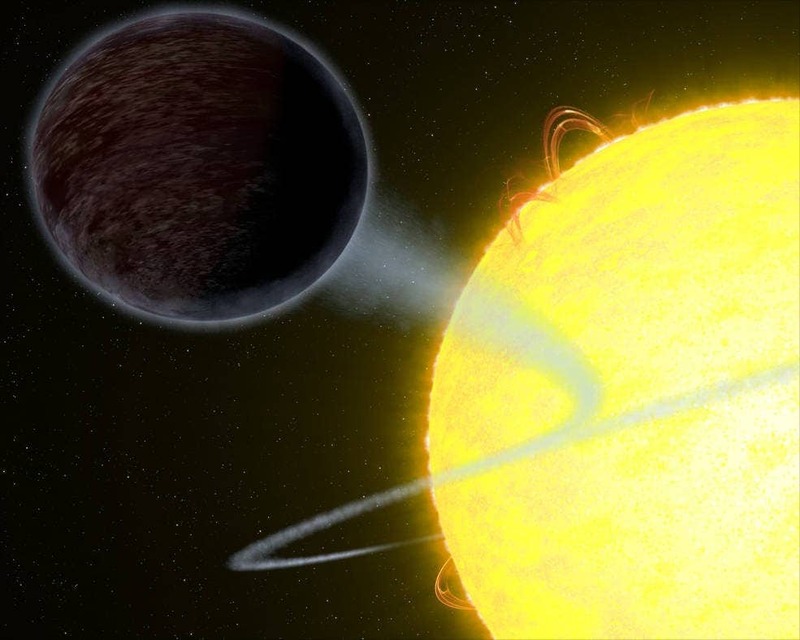 An oddball called WASP-12b, an exoplanet orbiting a star somewhat heftier than the sun, is the “blackest” planet we’ve found so far. NASA’s Hubble Space Telescope turned its lens towards WASP’s patch of the galaxy — some 1,400 light-years away — to find that this hot Jupiter traps at least 94 percent of the visible starlight falling into its atmosphere. The day side of the planet, called WASP-12b, eats light rather than reflects it into space. Credit: NASA, ESA, and G. Bacon (STScI). Hot Jupiters are gas giants that orbit extremely close to their parent stars. Being in such proximity, their orbital period is very short, typically less than 10 days. In WASP-12b’s case, it takes 1.09 Earth days to complete a full revolution. That’s around the main yellow dwarf star, since WASP is actually a trinary system and further includes two red dwarf stars, each roughly 37 percent and 38 percent of the sun’s mass, respectively. Orbiting so close to the planet also forced WASP-12b into a tidal lock, with one side always facing the sun while another is shrouded, just like our moon. On the day side of the planet, the surface gets blistering hot sitting at roughly 2,500°C (4,600 degrees Fahrenheit), enough to melt some metals. The day side is so hot it can’t possibly sustain any clouds, so the extremely intense light emanating from WASP just punches through the planet’s atmosphere where it’s absorbed by hydrogen atoms. Almost nothing is reflected, back making this planet darker than asphalt. The dark side of WASP-12b is a different matter altogether, as one would expect. It’s a full 1,090°C (2,000 degrees Fahrenheit) colder than the day side, a temperature still really high, but low enough to allow cloud formation. Previously, observations of the day-night interface detected evidence of water vapor and possibly clouds and hazes in the atmosphere. All of this goes to show that there’s still much we don’t know about hot Jupiters. Right now, anything between 2,500°C (4,600 degrees F) and 1,200°C (2,200 degrees F) is considered a hot Jupiter, and WASP-12b falls like an arc between these limits with its day-night sides. WASP-12b also comes as a friendly reminder that exoplanets come in all colors. Previously, Hubble detected another hot Jupiter with a glowing water atmosphere. Another Jupiter-like world called HD 189733b is a deep cobalt blue that’s reminiscent of Earth’s color as seen from space. Now, black is on the palette too.